Our guest post today is by Andrew Cotto, author of The Domino Effect, where he considers the importance of storytelling. I remember talking to a friend in graduate school about a project I’d been working on outside the confines of our MFA program. It was a story about a charismatic kid from Queens, with the nickname of Domino, who gave up on the idea of being “good” after it got his head busted open and his heart ripped out. A damaged Domino escapes to a boarding school in rural New Jersey, and, there, the story follows his transformation, over a tumultuous year, from the self-centered kid he’d recently become, back to the person he was raised to be: someone who looks after others, because the way we treat people affects the way they treat people and so on. Hence the title: The Domino Effect. I paused after my big finish, waiting for my friend’s enthusiasm to validate my work in progress. I shelved the project and focused on my thematically rich yet morally ambiguous literary mystery. When I finished the program, I decided to go back to The Domino Effect. This was the story I wanted to tell: it had a great voice, a complex protagonist, strong secondary characters, interesting settings, a page-turner of a plot threaded with humor and music, and themes both universal and unique. And, yeah, it was somewhat moralistic, which was something I had to figure out how to handle. I love storytelling for many reasons. I love the images and language and devices that make the narrative art form so compelling. I love the requirements placed on imagination. Most of all, though, I love story because it can evoke empathy. It can expand the reader’s understanding of the world by allowing for immersion in the experiences of others. By being transported into the reality of other human beings, the reader can be transformed as a result. Stories allow us to connect with humanity in an unobtrusive way. And, yeah, sometimes that connection comes with a moral, though, in good storytelling, this is never overt. One of the things I admire most about the Good Men Project is the manner which story is used to explore important matters in contemporary masculinity. While the content comes from a wide range of writers on a wide range of subjects, the message is always intended to be inclusive and devoid of judgment. They do not cast aspersions or arbitrate morality—they work exclusively within the territory of “good,” though those borders are as wide as their writers’ imaginations. While completing my novel, I recognized my friend’s distaste for moralizing. Stories are not polemics or speeches. Writers should not dictate what is right or wrong. We must not tell people how to think or feel or behave. We show examples of human beings in motion and allow readers to take whatever they choose away, and if part of that involves a notion akin to morality—well, fine. Everyone liked my father. He was funny and smart and what people around called a stand-up guy. He always talked to me about doing the right thing. About looking out for other people and helping them whenever I could. He talked a lot about his heroes, like Bobby Kennedy and Martin Luther King, Jr. I listened. I always listened because Pop was my hero. And I wanted to be like him, talk like him, act like him and everything. So that’s why they called me Domino. Because my father’s name was Dominick and, in Italian, ‘ino’ kind of means little, so “Little Dom” translated into Dom-ino. Everybody called me Domino, except my mother who called me Daniel, and my father who called me Pal. This relationship, and its dramatic shifts, is the heart of the book. I want readers to invest in Domino, to follow him through his journey, rooting for his redemption…or maybe not. That’s up to the reader. I’m just telling the story. Andrew Cotto is a teacher & writer who lives in Brooklyn, NY. 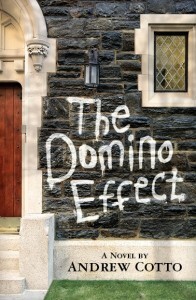 His coming-of-age novel, THE DOMINO EFFECT, is now available on Amazon.com. Outerborough Blues: A Brooklyn Mystery will be released in 2012 by Ig Publishing. Learn more about Andrew at his website, and follow him on Facebook and Twitter @andrewcotto . (This post was previously featured at The Good Men Project in October 2011 and was re-posted here at the request of the author Andrew Cotto. To see the original post: http://goodmenproject.com/arts/fathers-sons-dominoes-and-storytelling/ ). This entry was posted in Guest Posts and tagged domino effect, storytelling. Bookmark the permalink. ← 30 Days of Hunger Games – Event Finale!